Consumers, businesses, and communities have much to gain by becoming educated about and engaged in determining their energy future. The Power of the Red River Valley event provides an opportunity to do just that. The Historic Fargo Theatre was bustling with more than 140 attendees chatting over appetizers before the program started. At 7pm David Ripplinger from North Dakota State University Extension welcomed everyone and, with help from Lissa Pawlisch at the Clean Energy Resource Teams, thanked partners (Prairie Public, City of Moorhead, NDSUExtension, UMN Extension, and CERTs). We first heard about clean energy happenings in Moorhead from Jackie Maahs, Sustainability Coordinator, Concordia College and Dan Mahli, Assistant City Manager, City of Moorhead. 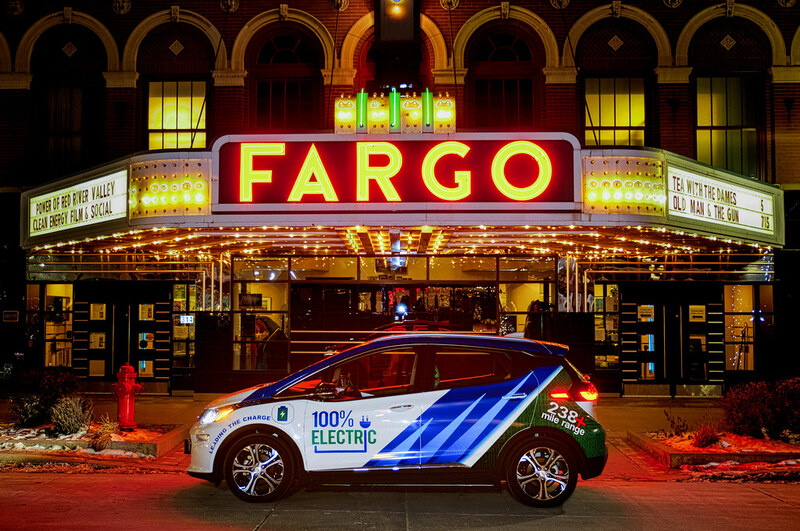 Fargo was up next, and we got to hear all about the eFargo effort, winner of the Georgetown University Energy Prize, from leaders Malini Srivastava at NDSU and Mike Williams, former Fargo City Commissioner. After the lighting talks we premiered The Power of Minnesota, a new documentary that features stories about the many ways in which clean energy is strengthening the economy and helping families and communities in the state. People stuck around after the film to engage in discussion with other attendees about clean energy efforts past and future in the Red River Valley! Read a humorous and informative account from Kaylee Cusack, Minnkota communications specialist, of her experience driving to this event in an electric vehicle. If you couldn’t make it, you can watch the documentary when it airs on Prairie Public on January 22, 2019 at 8:00pm or by visiting https://www.powerofmn.com. Moorhead citizens are passionate about sustainability. We are one year into our commitment into the Minnesota GreenStep Cities program and this event will let us celebrate our successes and dream about our next steps. Prairie Public is pleased to partner to offer this opportunity for education and discussion about clean energy. The subject of energy development is important to us all—and important to our community’s future—and beyond the exciting local premiere at this event, we will air The Power of Minnesota on television on January 22, 2019 at 8pm so that our entire broadcast area can benefit from its content.